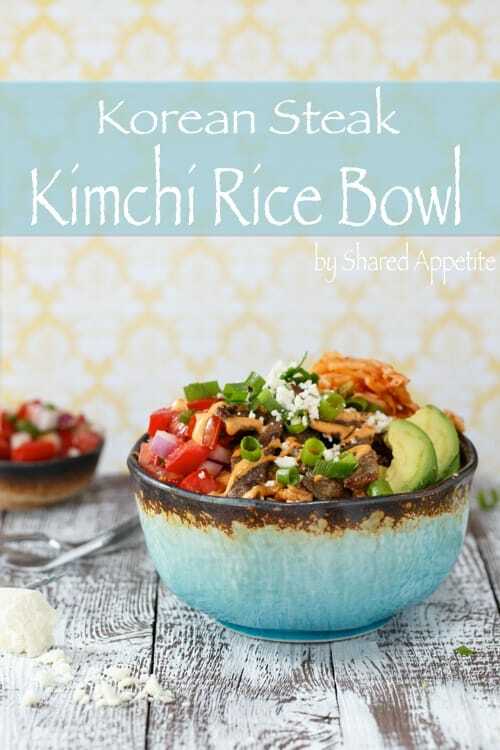 A hearty and flavorful Korean burrito rice bowl filled with bulgogi-style steak, kimchi, pico de gallo, avocado, and a homemade gochujang aioli. Growing up, if you asked me what my favorite foods were, I’d most likely tell you all things Mexican and mint chocolate chip ice cream. Specficially, mint chocolate chip ice cream from Friendly’s. Now that I’m older and am blessed with a more refined and dignified palate, I’m more drawn to… oh heck, I still love Mexican food and Friendly’s mint chocolate chip (with caramel… seriously, try it). But more and more, if you ask me what I want for dinner, it’ll be some variation of Asian food. Korean. Sushi. Thai. Indian. So do you know what’s super awesome? When I can get all wacky and crazy at home and combine my nostalgic and familiar love of Mexican food with the flavors of Korea. And rice bowls are just pretty darn awesome in general, aren’t they? I mean come on, it’s a complete meal in a bowl! I know, what a cliffhanger. 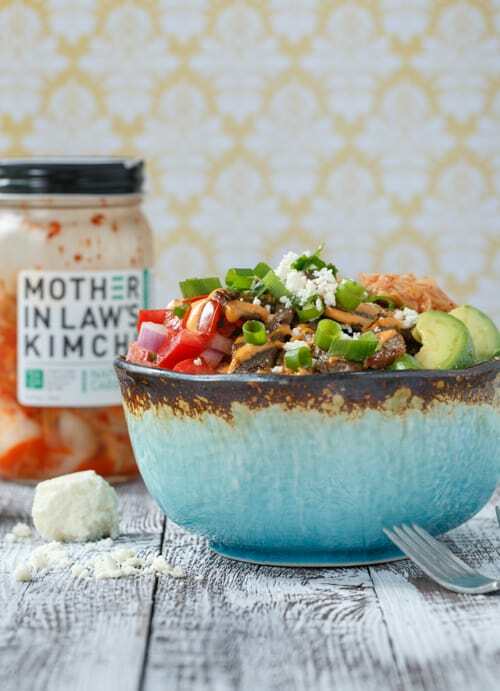 So are you wondering what’s up with the whole kimchi thing? Don’t feel bad. I know I was pretty skeptical of the stuff when I first encountered the fiery, fermented Korean side dish staple a couple years back. Here’s the deal. It’s super important in their culture, and can be found at the dinner table pretty much every single day in Korean homes. Kimchi has been made for a thousand years as a way to preserve vegetables for the winter. And although you can pretty much use any vegetable for kimchi, the most common by far is made with cabbage. It has a potent flavor like probably nothing you’ve ever tasted. Divide rice among bowls. 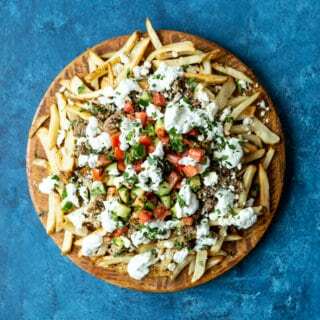 Top with Korean steak, a spoonful of pico de gallo and kimchi, some sliced avocado, drizzle of gojuchang aioli, and a sprinle of queso fresco and scallions. Serve immediately. Place steak in freezer for about 15 minutes, which will firm it up a bit, allowing you to cut thin slices. Trim excess fat from steak and very thinly slice. Using the finest side of a grater, grate the pear and onion. Combine with garlic, ginger, soy sauce, brown sugar, mirin, and sesame oil (optional) in a medium mixing bowl. Add thinly sliced steak, cover with plastic wrap and place in refrigerator, allowing to marinate for at least 2 hours. Remove steak from refrigerator approximately 20-30 minutes before ready to cook. Remove steak from marinade and combine with scallions in a bowl. Heat canola oil in wok or large skillet over high heat. Add steak and scallions to pan in a single layer and cook, stirring, until cooked through, about 2-3 minutes. It’s important to cook in a single layer to avoid steaming the meat. 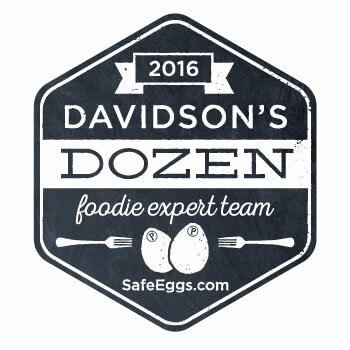 Cook in batches if necessary. Mix all ingredients together until well combined. Refrigerate until ready to use. Can be made up to 3 days ahead of time. Use extra gojuchang aioli as you would any condiment, for topping sandwiches, tacos, and such. 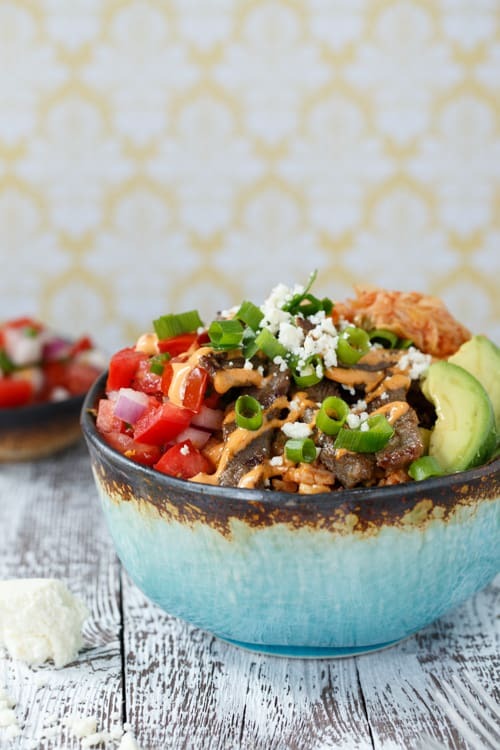 We’ve been doing homemade burrito bowls a lot lately – so easy to pull together. But I’m loving these rice bowls! So different than what I normally make – and with the steak? Yum! Aren’t burrito bowls awesome? 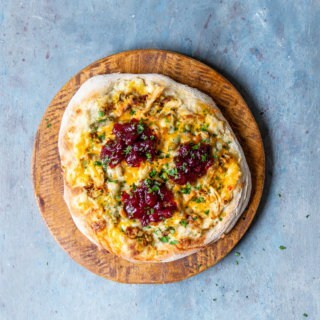 Totally easy to customize and make everyone at the table happy. And I recently started making rice in a Zojirushi rice maker that I (well technically, my wife) got for her bridal shower a little ways back. It makes perfect rice with zero effort! We love Korean food in our house. It’s funny how you mention mixing Korean with Mexican because we always felt that Korean food is very similar to Mexican food just without the corn. Oh and I have in fact tried Friendly’s mint chocolate chip with caramel sauce…when I was a kid…but I wouldn’t be turned off if someone gave me a bowl now!!! Haha totally! Sandra, we know what’s good. Mint chocolate chip and caramel is pretty amazing. There is so many delicious spices in this dish I can practically smell it from here, looks wonderful! I love any dishes with kimchi! And this looks AH-MAZING! 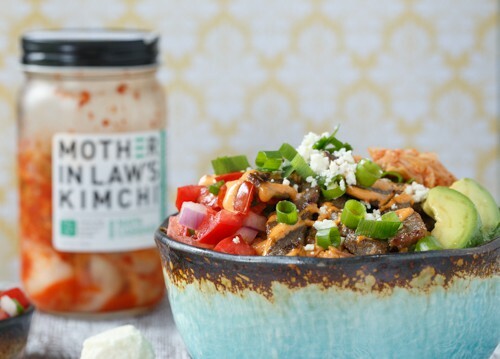 Love that label “Mother In Law’s Kimchi” that’s hilarious! Pinned.